Want to get a super food like pumpkin into your family? Put it in cookies! My husband, who doesn’t even like pumpkin, loves these healthy pumpkin cookies. The whole wheat version of the recipe hardly tastes different than the unhealthy pumpkin cookie recipe I started out with, and they remain quite easy to make. It’s one of those recipes that I’ve had saved on my computer since long before I started blogging, because so many people ask for it after I bring the cookies to an event! Get this recipe, updated and improved with tons of FAQs, in the eBook “Smart Sweets,” along with 29 other delicious desserts that won’t make you feel guilty! Click HERE for a table of contents. Of course, I was tickled to see that the saved version still had shortening and only one cup of whole wheat flour in it. If you’re a die-hard soaker, I’ll be sure to update this post after I try the cookies with sprouted flour once we’re back to grains this fall. UPDATE: Sprouted flour works wonderfully! Sub butter for the shortening. Do this one at the very least! Then throw away your shortening can! Reduce the white sugar by up to 1/2 cup. Better yet replace some of it with a healthier sweetener like sorghum syrup or maple syrup. Sub in one cup of whole wheat flour for one cup of the white flour. 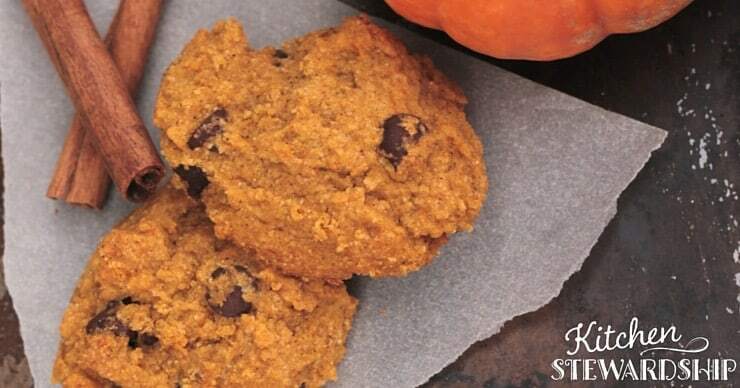 With two variations using either raisins or chocolate chips, you can truly make these seasonal pumpkin cookies be a totally different experience. I rarely run into anyone who doesn’t love them. *If using spelt flour, make up the dough and allow to rest overnight in the refrigerator to allow the spelt to soak up the liquid. Stir together flour and next 6 dry ingredients. Stir in choc chips and nuts. 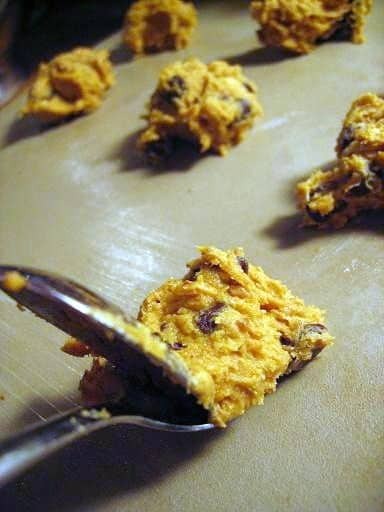 Drop rounded teaspoonfuls two inches apart on a greased cookie sheet. Makes 6 – 7 dozen cookies. Use half the 29 oz. can and freeze the rest for another batch – it’s only 20 cents more than the 16 oz. You could also put pumpkin in soups, chili, and spaghetti sauce as extra nutrient boosters. Try my Simple Cabbage Soup, healthy pumpkin muffins, or 20 Ways to Use up Leftover Pumpkin if you’re still trying to finish the can! If you can make your own homemade pumpkin puree, there’s no comparison in these cookies. 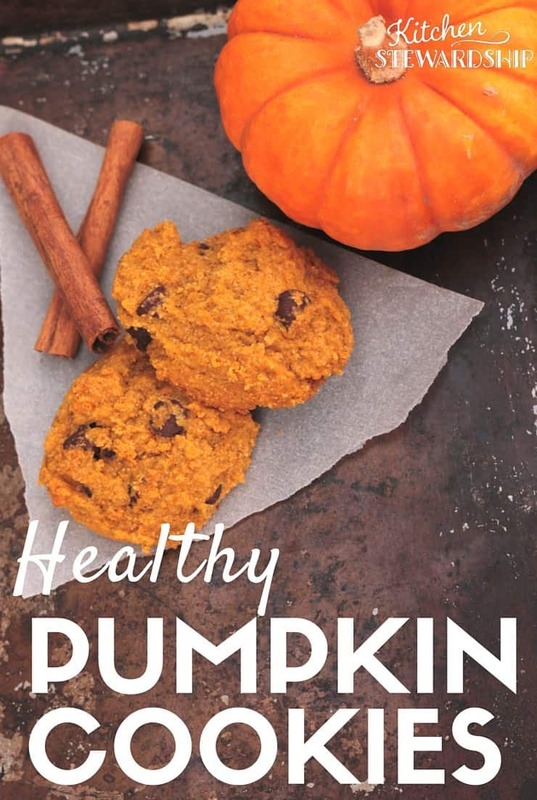 My preferred method is real pumpkin and the honey, which make the cookies so fluffy and sweet, you’ll be shocked there’s so little sweetener. Even non-real-food eaters ask for the recipe when I bring them to share made that way. 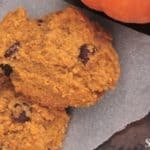 Perfect for a Halloween party, Thanksgiving dinner, or potluck at your kids’ school, healthy pumpkin cookies will be a huge hit! The recipe is so simple, too, that your kids will love helping you out in the kitchen. This is a huge batch, but the cookies freeze excellently and are even good right out of the freezer (or thaw in half an hour on the countertop). This post contains affiliate links to Amazon, Vitacost and Tropical Traditions from which I earn a commission. See my full disclosure statement here. These look really good. I think I can handle 1 1/2 C sugar for that many cookies! 🙂 Thanks for the recipe. I think I’ll have to make some for our after church snacks this next week! Thanks, I love pumpkin recipes! I made your cabbage soup the other day and it turned out great! I’m going to try and make these this weekend. Incredible! I just made some cookies from a very similar recipe this morning! Except I used a buttercup squash, and added dried cranberries instead of the nuts and chips. Both of which were experiments on my part, and they turned out GREAT! The buttercup has such a mild flavor, the spices stand out more. I’m not sure I’ll ever go back to pumpkin! Wow! These are so good! I made them gluten free and egg free(used cornstarch instead of the eggs). Thanks for such a great recipe. I wanted to bake today because it is finally somewhat cold here in CA, these were perfect and made the house smell great. So light and fluffy….I think I could eat the whole batch, but I won’t. Thanks again! 2 cups shortening? That’s as far down as I got! You should have read down farther and looked at the revised, healthy version. Have you ever made a half batch? It looks like you could just cut all the ingredients in half but I know that doesn’t always work well. I may try it tomorrow because I don’t know if I need 70 cookies in my house, healthified or not. if i chose to use fresh pureed pumpkin, as I have it in the freezer, how could I measure to equal 16 oz canned? Where do you find white whole wheat flour? My local grocery store doesn’t stock this. The cookies look delicious! Has anyone used honey in this recipe instead of the sugar? Chuck a spoonful into the dough every time you make bread, and/or sub flaxmeal gel for eggs when you make cornbread (1 T. flaxmeal stirred into 3 T. hot water & allowed to cool). Tastes great. Hi! Cookies are delicious. However, I’m not sure if they’re a little floury tasting, or if it’s just the pumpkin flavor sabotaging itself as flour? Has anyone else experienced this? My son can’t eat enough of them, so maybe it’s just me! I’m wondering if I can freeze the dough, and if so, how long will they last in the freezer? These cookies were a great balance between healthy tasting and treat filled. I substituted the shortening–splitting the difference between butter and flaxseed meal. You couldnt tell the difference and the cookies turned out super soft and moist. The recipe makes plenty to enjoy now and freeze some for later. That is so helpful when feeding a large family! Thanks for a great recipe! So do I understand this right… You would use 1 1/2 cup of fat AND 1 1/2 cup flax meal? Just want to be sure so I don’t mess these up later today. Thanks? Looks like I wasn’t into my comments in time to help you, but yes, 1 1/2 cups of each. I know it seems like an unbelievable amount of flax meal, but it works! Hope yours turned out yummy! I just made these this week, the healthiest version, and they are very good. I’m sort of considering adding back another 1/4c to 1/2c of sucanat though to make them closer to the level of sweetness I usually expect from a cookie. They are still good with 1.5 C sucanat, but I find that sucanat is already less sweet than refined sugar and I think the whole wheat flour and/or the flax seeds give it that “healthy” taste. although, that being said, my boys love them the way they are and I don’t feel like I’m really compromising anything to let them eat a couple for a snack or as dessert. These sound really good and I love how you have provided all the variations – fantastic! I made the healthyest version with raisins and they are so good, my kids like them and I have not found too many healthy cookie recipes that they actually like, so THANKS! I made 1/2 the recipe and did 1/2 butter and 1/2 coconut oil. Oh, and I just noticed I was supposed to use the white whole wheat…used regular whole wheat and they seem fine..somehow I think the honey makes them extra fluffy! Thanks! Hi, I found this recipe while searching for something wholesome to make with fresh pumpkin puree. I made them last night, and while they were very delicious, they were super fragile! You can’t handle them at all without them falling apart. They aren’t dry, just fragile. I’ve never had this problem with other cookies. I didn’t see any other comments about this, and I’m wondering if I did something wrong. I followed the final “healthier” version of the recipe, and the only things I did differently are 1) I halved it, 2) I used 50/50 butter and cocount oil because I didn’t want to use up all my good butter, 3) I used whole wheat pastry flour instead of white whole wheat, 4) I used 75/25 sucanat to honey because I ran out of sucanat, and 5) I didn’t have any allspice, so I left that out. None of those things seem to me like they’d make the cookies so delicate, but I guess I don’t know! I made cookies for my grandkids with a hundred percent whole wheat pastry flour. it worked just fine. the only time I have trouble with fragility in baked goods is when I don’t use eggs. one time in my teens I forgot the eggs in a boxed cake mix. Do your kids tolerate the flax very well? I like to bake with flax for the health benefits but can’t use nearly the amounts recommended as a fat substitute because it gives my kids (6, 4, and 2) the runs. They tell me their tummies don’t hurt; they feel fine, just visiting the potty a lot more. I figure they just can’t handle all that fiber, plus the whole grains. I’ve been making a lot of muffins lately, and for a batch of 24 muffins, about 1/4 cup of flaxmeal is enough. Made these today for a housewarming party. They are delicious! I used half coconut oil, half butter and home-sprouted flour. I didn’t add any add-ins, but I did use twice as much spice as called for and I dusted the tops with more spice. They came out soft, fluffy, chewy, perfect 🙂 Thanks! and ended up here. could you give me a link to that particular article. thx for the help, I appreciate it. Incase anyone is interested I subbed half the butter with unsweetened applesauce with good results! I made with whole wheat flour instead of white whole wheat and they are really good! I put chocolate chips in but I’m finding I like the ones that didn’t get any chips in them better! The name for these should be “Addictive 100% whole wheat pumpkin cookies”!!!!! Our three daughters are spending some time with their grandparents tomorrow morning while I attend a meeting at our church…what to make and share at both places??? Why not a batch of 70-80 cookies!!! 🙂 These are AMAZING….I wonder how many will be left come morning time!! hee!hee! Thank you, Katie, for all you do!!! Myi think I’m in LOVE!!! Thanks Katie! Loved these. I started with making your pumpkin pie oatmeal and had leftover pumpkin so then made these. It made a huge batch so we have plenty frozen for later. I liked using the ground flax seed. Would using unsweetened applesauce work for some of the fat? I saw that recommended in one of your brownie recipes in your e-book and have a few (okay, a lot) more weight to lose from my last pregnancy. Applesauce tends to work pretty well to replace fat in many recipes – although I can’t remember if I’ve ever tried it with cookie DOUGH but more likely quick bread or muffin BATTER – could be different. That said – if you want to lose weight, it’s the grains and sugars, in my opinion, that you’ll want to cut…these cookies are pretty awesome on how low you can go with honey!